So make sure to tune in for our True Detective recap for all the up-to-the-minute details at 9 PM EST! 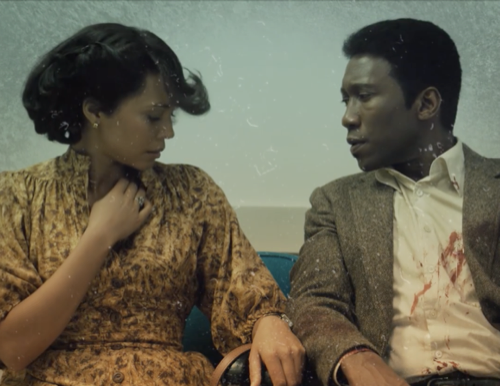 While you wait for the episode please check out all our True Detective videos, news, recaps and more, here! Tonight’s True Detective episode begins now – Refresh Page often to get the most current updates! Tonight’s episode opens with Hays and Amelia are in bed, they share a cigarette. Then we see West and Hays they are listening to the tape. West goes in to see Tom Purell and tells him to sit down. He asks Tom if there is something he wants to tell them, they can make a case for him. Tom looks shocked, asked West if he thinks it was him. West says a couple of neighbors saw him working in his garage on the night the kids disappeared after that nobody knows. Tom says he went into the house, had a couple of beers. Hays tells Tim about Julie’s room, the hole in the wall that comes through to Will’s room. Tom loses it, he is very upset and angry. West and Hays continue to cross-examine him. The DA wants to arrest Tom, but West says there is not enough evidence. Fast forward to 70-year-old Hays, the interviewer says that the phone call was a major turn, law enforcement considered an indictment. Hays says the call came from a truck stop, it was Julie. In the ’90s Hays and West check out the truck stop but find nothing. Hays is home now, Amelia mentions that she is working on a sequel to her book. The two get into another argument, there is a lot of tension between the two. West and Hays go over Tom’s life with a fine tooth comb, they interview people at his job again. They find out that Tom didn’t get around with the other guys. They then head to his house and look around. West finds lots of bills that are past due, Hays finds some photos of the children, and West finds a pamphlet from a church that reads homosexuality can be cured. The two head in the car and Hays starts thinking back to when the evidence was found/or planted., at Woodard’s place. 70-year-old Hays is shown a photo of Lucy’s cousin’s corpse, she says it was believed that Tom had planted the evidence. Hays and West visit the man who found the backpack, he says that Harris James said it looked like the boys. They visit Harris James, he is now Chief Security Officer at a food plant. West mentions the Purcell case, James admits he thought the backpack belonged to the Purcell boy. West asks James why he left the force, he doesn’t give him an answer. They really don’t get any info from James, they leave. The interviewer asks 70-year-old Hays if he has ever sat back and really thought about all the fatalities in this case. Not only did Lucy die, but so did her cousin and later in 1990 James vanished. Hays asks to stop the interview, he tells her he is done. Amelia is at a home for young girls, one of the girls recognizes a photo of Julie, but she went by the name Mary. The girl tells Amelia that if she wants to write a book, she should write about what happens to girls there. West and Hays are driving, they get a message that a guy wants to speak to West. They head to a diner, they meet with Dan. He wants seven thousand dollars, and for that, he will give them information. A man comes into the diner, Dan tries to get away but Hays won’t let him. Dan says that the clock is ticking, the longer they take to procure the money. the more time the other people have to find Julie. Tom is let out of jail, he overhears two officers talking about the case. Hays is with his son, they share a cigarette after the interview. Hays figures out that his son had an affair, he asks him if he is going to leave his wife. He says he didn’t mean for it to happen, it just did, it was exciting. They change the subject, his son says he has the addresses he wanted, what is he planning. We go back to the ’80s the DA has a press conference and announces that they declare that Woodard was the one who killed the Purcell boy and probably Julie as well. People in the room ask questions, Lucy and Tom storm out. Forward to the reopening of the case, West tells Hays they need to take another look at who could have planted the backpack. West wants to drive Hays home and he doesn’t want to, they get into an argument, Hays gets out of the car and starts to walk. West leaves him and drives off. Dan is at a motel, he goes to get himself a drink from the vending machine and Tom is there. Tom pushes Dan into a room, he has a gun and has it pointed at Dan’s neck, asks him what he knows about the kids. Tom eases up on the gun and the two get into a fight. Tom wins and gets the gun back. Tom tells Dan that he made the peephole in Wills room so he could peek on Julie when she was getting dressed. Dan says he knows the man’s name who was giving Lucy money before she dies that is all he knows and was going to give that to the police. Hays visits the Purcell home, there is a lot of graffiti inside and it looks really run down. He takes a piece of paper and folds it, he figures that the kids made the whole to pass notes to each other. We fast forward to the older Hays when he visited West. They talk about the case, Hays goes to the bathroom and comes back confused, finds West looking at Amelia’s book that he brought with him. All of a sudden, Hays remembers that it is 2015. Amelia is at a book review. A man in the audience asks her if the girl is alive, Amelia says that they found some fingerprints. The man asking the questions is the one with a glass eye. He is angry and tells her she knows nothing and she is just making money off the story, shame on her. Tom is driving and drinking, he passes the Hoyt residence and sees some men outside. He goes around another way and breaks into the house. He has his gun pointed while someone is watching him on video surveillance. Tom is in the basement of the house, there is a steel door, he opens it and continues down a passage to a pink room. He says, “what the hell, Julie” and we see James behind him.